The latest twist in the important controversy of Family Guy making fun of Trig Palin: An actress with Down syndrome said Sarah Palin "does not have a sense of humor." She was in the offending episode. Updated with more zing! 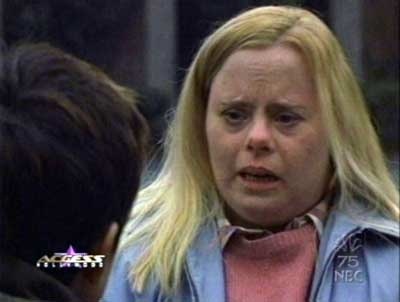 Andrea Fay Friedman played the girl with Down syndrome Chris dated in the episode. (Her IMDB says she's been on Saving Grace, Law & Order: SVU and 7th Heaven among other shows.) She was the one who said the fateful line which incurred Sarah Palin's facebook-based ire: "My dad's an accountant, and my mom's the former governor of Alaska." (Gawker.tv has got the clip.) And she has something to say to no-fun Sarah Palin, which she said in an email to the New York Times. How does one say in English... "Zing?" The Times, however, stops at "my parents raised me to have a sense of humor and to live a normal life." They must have done the calculations and figured that being able to interview Sarah Palin in the future was worth more than printing Friedman's awesome email in full. How mainstream media. It's too bad, because the best part about Friedman's response was also the point—such as there was one—of the Family Guy gag: Palin used Trig so blatantly as a campaign tool, and positions herself so squarely as the voice of the disabled community (see: "death panels"), that of course the one person with Down syndrome to appear in the Family Guy episode would be related to her. We can think of many, many well-meaning but possibly 'edgy' jokes to make right now. But we're watching the Olympics and don't feel like reading a bunch of pissed-off comments from people who would, like Sarah Palin, take these jokes the wrong way. So, let's just say: Excellent work, Andrea Fay Friedman. Stop being so wimpy, New York Times. And: U-S-A! U-S-A!